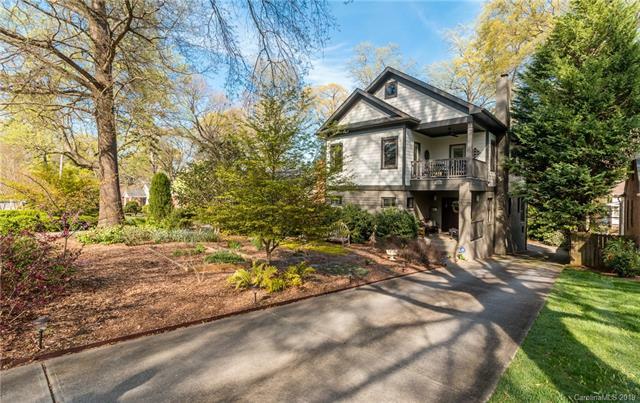 Featured on the '16 Plaza Midwood Home Tour, 1812 Truman Road is filled with character and designed for entertaining. Wide open living/dining/breakfast/kitchen on floor one, with a welcoming front porch and back dining porch. Spacious kitchen has a wet bar with wine fridge, custom painted grey cabinetry & stainless appliances, including a 5-burner gas downdraft cooktop. First-floor study/office could be used as bedroom 4. Upstairs, there are 3 bedrooms & 3 baths, including a spacious owner’s suite with sitting room/study, luxurious bath, and walk-in closet. A window-filled hall/landing lets in amazing natural light. Relax on the 2nd-floor balcony, accessed from the other two bedrooms. Basement level has a family/bonus room with storage (perfect for home theater), plus a rare find in Midwood, a spacious two-car garage. Welcome home!